To misquote Strictly Come Dancing‘s Craig Revel Horwood, It Takes You Away had no opening, ridiculous waffle about sentient energies and some debatable silliness about the future ovine (that’s pretentious for sheep-like) rebellion, and grandmothers. None of that matters, because it was Fab-u-lous! I’ll even put up (grudgingly) with yet another Gallifreyan fairy tale monster. When I first spotted this episode would be set (at least initially) in Norway, a distant bell rang at the back of my mind. Some digging brought me to the 1999 Nick Walters Eighth Doctor Adventures novel, Dominion. The novel is set in Sweden, amongst forests and lakes, so the resemblance is entirely meaningless. In the novel, there are monsters in the woods and a pocket universe connected by a wormhole, and if things aren’t checked, it could spell doom for the Earth. Hmmm, maybe there are some similarities after all. Hold that thought. Having set up Norway, and a figure glimpsed at a window, Ed Hime’s writing moved us into the messy house and we soon met blind teenager Hanne, played by actor, Eleanor Wallwork. Before I heap praise on the character and performance, a digression. What drives good story? Plot or character? The very best writers can create masterpieces with one or the other, but most of us need to pay attention to who our characters are and what they are doing (and why!). Hime covers both bases well, and Hanne is the prime example among the guest characters. Her being blind makes several elements of the story work, including the monster in the woods, and she also acts as a point of view (!) with the episode giving us plenty of chance to experience events from her perspective. Hanne is resourceful, but not superhuman. She is scared and determined and acts as a result of clear reasons. She wants her Dad back. Her lack of sight was downplayed in the tunnel between the worlds with Ryan (Tosin Cole) needing a light to help guide her, rather than her being able to lead through sound (no white sticks in this story). What it did do without fanfare was allow her to be clear that the figure of her mother wasn’t actually her mother. Excellently written and delivered. 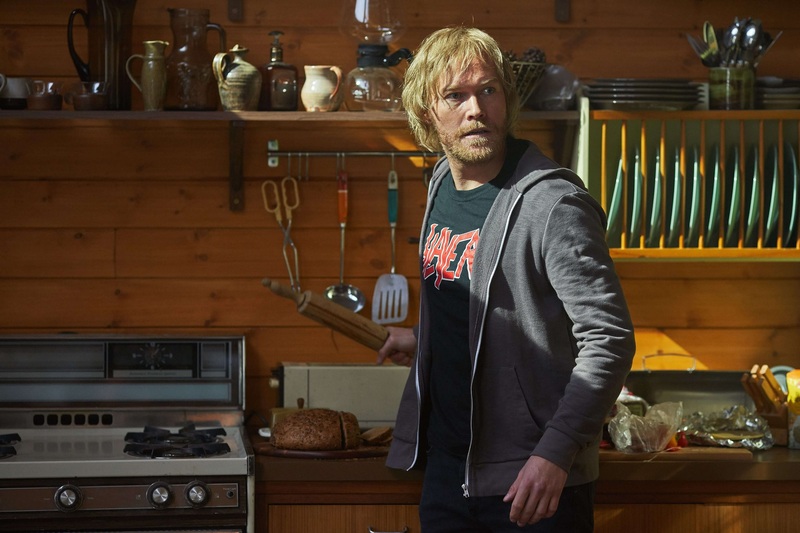 It’s a shame her father, Erik (Christian Rubeck) was less inspiring as a person abandoning his child, but he has his motives as well. 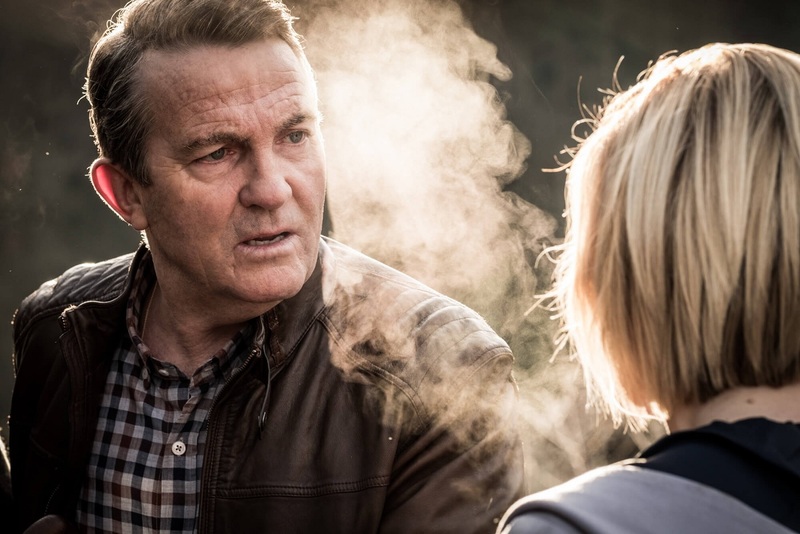 Both Erik and Graham are affected by grief, and once again Bradley Walsh almost steals the episode in his scenes with pseudo-Grace and his soul searching. Let’s not forget Ryan, who also suffers from the death of Grace and the void left by his father’s lack of interest in him. Grief is powerful, and intertwines with loneliness, the force driving the strange energy consciousness at the heart of the story. It’s high concept (once we get there) and allows both Erik and Graham to experience part of their journey of coping. Talking of journeys allows considering of structure and even myth. It Takes You Away is a three-act story with worlds within worlds. We start on Earth with a potential base under siege, but it turns into Alice Through the Looking Glass and the second act takes place in a classic underworld of flesh moths and Ribbons (the creepy Kevin Eldon). There was also a moleman, but he didn’t make the cut. Was this underworld (or antizone) the source of all evil? No. Meanwhile back on Earth, Ryan has solved the mystery of the monster in the woods, and, in Scooby Doo style, it’s a simple trick. Ryan and Hanne enter the underworld, but don’t make it through. 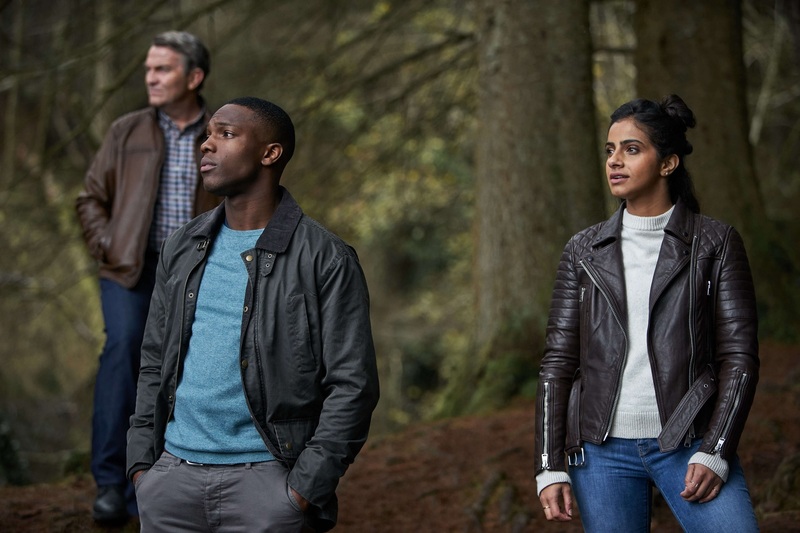 The main group of the Doctor, Graham, and Yaz (Mandip Gill) survive the horrors to find themselves back at the portal, or so they think. This is where the writing is clever; the whole sequence in the antizone is to set up a mini-journey – a conflict but just when you think the heroes are returning home, they find themselves in a new and better (tidier at least) world. Cue Act 3, and we finally learn just what is happening. Missing father Erik is rather passive, and I forgive him as he thinks his wife is back, but don’t forgive him for abandoning his daughter, if only temporarily. There’s some shouting, some sonic, and a big sacrifice from the Doctor. Cue the big mythic sequence. When you’re a very-long-lived Time Lord, the idea of spending some portion of eternity in a pocket universe isn’t the end of the world. Even if rushed, the sacrifice makes some sense and the dissolve to white opens up all sorts of possibilities. Just as this fan was wondering just who Jodie Whittaker’s Doctor might meet – Susan perhaps? – we get the talking frog on a chair. Brilliant, mad, and iconic. Did I mention brilliant? It’s off the wall in a way the show hasn’t done for what seems like ages. Okay, we’ve had killer Santa robots since the reboot, but the talking frog is wonderful. 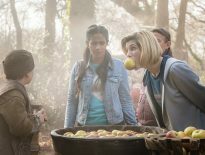 Ignoring some silliness, exposition, and jumping to the right conclusion on little evidence, this is a decent episode for the Thirteenth Doctor with some caring, compassion, decisiveness, and perhaps some distance between her and her human companions. She does care about them, but also prepared to let them find their way home from Norway while she spends an unqualified length of time with a strange alien force. Great stuff! Yaz gets to use some police training and, while not central to much of the story, isn’t rattling around doing nothing. I’ve mentioned Graham already, and if this were a conventional story arc, we’d say he is now ready to move on and either leave the fantasy world of the TARDIS and rebuild a life as a widower, or perhaps a noble sacrifice so he can be with Grace again? We know Bradley is in the New Year’s Day special, so this issue could be ducked. Ryan deserves proper consideration. Why is this the episode in which he finally calls Graham granddad? It’s down to his time with Hanne. Ryan upsets her with his initial thoughtless comments, spots the speaker wires, tries to look after Hanne, gets knocked out then comes to her aid in the antizone. He treats her as an equal without making a fuss and sees her reconciliation with Eric. He is looking at others and (as had to happen) identifies with Graham’s grief, matches it to his own, and shows maturity as he reaches out to Graham and builds a proper connection. If Graham were to leave, what would Ryan do? It’s an interesting question. All this brings us to the writer, Ed Hime. On the strength of this story, more Hime in Series 12 would be most welcome. I mentioned some similarities to the Eighth Doctor Adventure novel, Dominion. Apart from proving I’ve read, watched, and listened to far too much Doctor Who, it probably means nothing else except the extended continuity is very large, and ideas will come around more than once (aliens trapped under a hill for millennia, anyone? I’m looking at you, Witchfinders). It does let me talk about alternate types of Doctor Who story, something that happened more and more when the show was off the air. Ed Hime is not only known for his work on Skins, but a look at his profile also shows he is involved in the Big Talk Productions remake of Sapphire and Steel. Talking frog aside, It Takes You Away is a classic Sapphire and Steel story, and let’s face it, that show was more than a little influenced by Doctor Who (and many others). It all bodes well for Sapphire and Steel, whenever it arrives. So, rambling aside, this was a good episode, and it wouldn’t take a lot to make it absolutely fantastic. 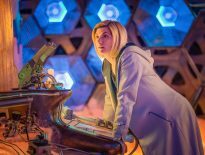 Is it the best episode of Series 11? It’s certainly a strong contender. 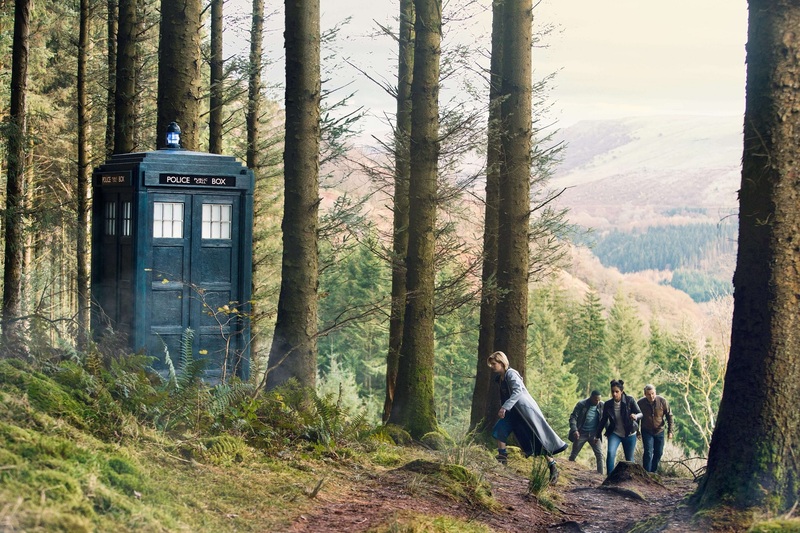 ← What Did You Think of Doctor Who: It Takes You Away?